Matt Zurbo Review: My Dad's a Wrestler! 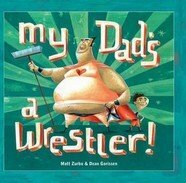 Matt Zurbo Review: 'My Dad's a Wrestler,' states the narrator of this slyly funny picture book, but then adds, 'not the famous kind though.' So begins a son's story of his father's passion and love for the sport of wrestling. Dad works as a storeman during the day, delivering, sorting and storing boxes marked fragile in a less than circumspect manner. At night he transforms into the Percolator, a fearsome, overweight baddie who, on the rare nights he wins, enjoys the howls of derision from the mere handful of spectators who attend the wrestling bouts. The Percolator's seeming lack of success in the ring does nothing to diminish his son's hero worship of him. He can be seen in the stands, forever whooping with delight at his father's exploits in the ring. Dad's lack of success in the ring is mirrored at home. His wife has the upper hand. In one memorable image we see the Percolator, flat on the canvas, (the kitchen floor) on his stomach pleading for his wife to release him. The wife stands over the Percolator in a dominant wrestler's stance, seemingly waiting for a signal from him; an admittance of his defeat. In fact, the boy likens the legendary strengths of the Cyclops to his own father's strengths as the Titan lite, 'the Percolator.' The Greek myth theme, that the book hints at, is ripe for exploration as an extension activity with text-based intervention. Also, this Matt Zurbo review wouldn't be complete without a quick word about the images by Dean Gorissen. They are full of character and colour, and contrast beautifully with the poker-faced text. A terrific book and a real find. Recommended for children aged 8 -12. My Dad's a Wrestler can be found at fishpond online book store.